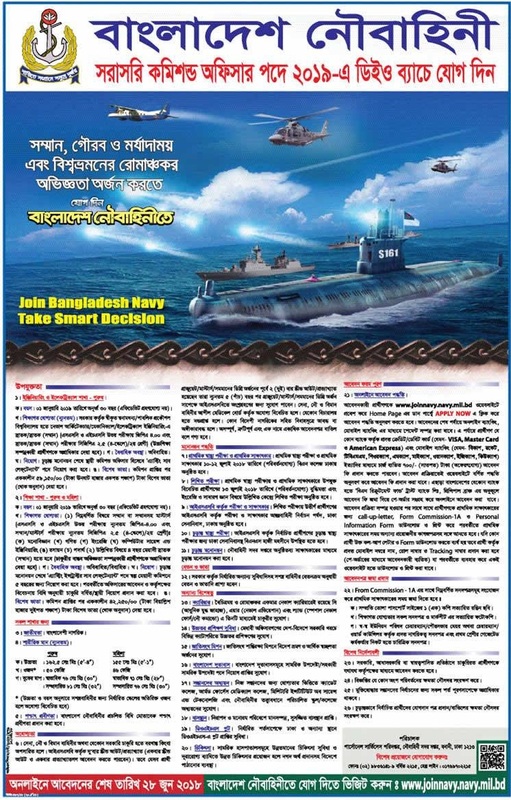 Bangladesh Navy Job Circular 2018 has been published in daily newspaper Kaler Kantho and to get from the most popular jobs and education portal website in Bangladesh by today job news.com Anyway, As a know, the Bangladesh Navy is the naval warfare branch of Bangladesh Armed Forces, responsible for Bangladesh’s 118,813 square kilometers of maritime territorial area, and the defense of important harbors, military bases and economic zones. Good news is, recently the Bangladesh Navy Looking New Job holder for their empty vacancy. However, if you are interested government jobs in Bangladesh, we think Bangladesh Nave Jobs 2018 is Good one, so interested candidate checkout all of essential information like apply procedure etc, for the user help, we have already added all of necessary requirements such as job circular image, published date, salary structure, application deadline and more.So let’s check and get ready for Bangladesh Navy Job Circular 2018 and finally to submit your application by following their applying procedure. ■Job Location: Anywhere in Bangladesh.